Unidentified armed Syrians infiltrated an unmanned Israeli army post in the Tel Faris area of the southern Golan Heights Tuesday night. It is believed they may have been radical Islamist rebel fighters, possibly members of the Al Qaeda-linked Jabhat al Nusra (Al Nusra Front) terrorist group that has vowed to conquer the Golan Heights after its civil war against President Bashar al-Assad has been won, and then eventually all of "Palestine." The two were spotted by soldiers from the IDF’s Nahal Brigade during a routine patrol of the area, but managed to flee before the soldiers arrived. IDF forces searched the area for the infiltrators. At around the same time, the same IDF unit came under fire by government forces fighting for Syrian President Bashar al-Assad. It is believed they may have been targeting rebel fighters at the Israeli outpost. IDF soldiers returned fire towards the source of the shots, and no injuries or damage was reported by the unit. According to the IDF Spokesperson’s Office, “During a routine patrol, suspicious activity was observed at an abandoned outpost in the southern Golan Heights, on the eastern side of the fence. The forces came under fire during their patrol, and returned fire to the source of the shots. There were no injuries or damage reported. IDF forces are searching the area for the perpetrators,” the spokesperson added. 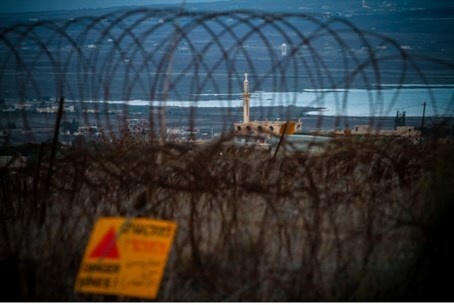 Six mortar shells were fired from Syria at Israeli territory on Tuesday. All of them exploded in open areas of the Golan Heights without causing damage or casualties.